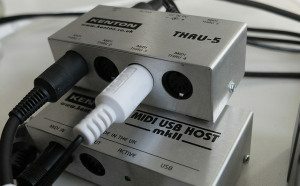 In our article ‘More MIDI, Less Computer’ we showed how to connect the OP-1 to the Analog Four/Keys (or an equivalent machine) using a Kenton MIDI USB Host. But what if you have a more elaborate setup? Let’s say you also use an iPad and a DAW on your desktop computer, and you would like to sync them with an OP-1 and one or more Elektron boxes? Here’s where another little Kenton box comes to the rescue. The Kenton Thru-5 is a 1 MIDI in, 5 MIDI out box. It receives MIDI data from a MIDI OUT signal (e.g. a sequencer, a DAW, a master keyboard, etc.) and creates identical copies at the 5 MIDI THRU sockets. These can then be connected to the MIDI Ins of synths, sound modules or other devices. 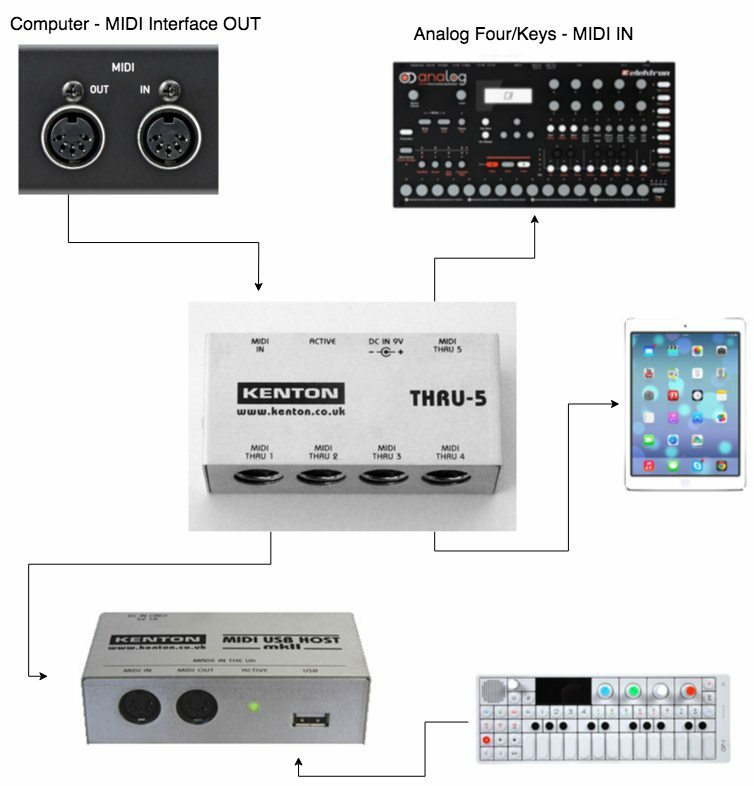 The Kenton Thru-5 works for ALL MIDI messages including Clock, SysEx, MTC etc. Then we will connect an iPad (using a MIDI adapter cable and the Apple Camera adapter) and the Elektron Analog Keys to two of the Thru-5 sockets. Then we will connect the OP-1 to the Kenton MIDI USB Host. Voilà! Once the cables are all plugged, it’s just a matter of configuring the MIDI sync for each device (with Logic Pro being the master and others set as slave, to receive clock and transport messages). Check the manual for each instrument if you are not sure about this step. Note: as pointed out in the comments, when using a computer, you may also connect the OP-1 to a USB port on the computer itself. Personally, having the Kenton MIDI USB Host I would rather use that for the MIDI routing and spare the CPU some work, but I’ll leave it up to you. Note 2: if you would rather have your Elektron synth to run as the master clock, well, you’ll need a different DAW. Logic Pro doesn’t accept MIDI Clock sync messages (only MTC and MMC), like the ones sent by the Elektron Analog synths. Quite frustrating, I know. Ableton Live works fine for this purpose though (haven’t tried other DAWs). If we take the computer (and the DAW) out of the equation, the two Kenton boxes make even more sense. We could, for example, let the Elektron synth be the Master Clock (connecting it to the Kenton Thru-5 MIDI in), use the Thru-5 MIDI out to control other synths/drum-machines and/or the iPad, and the Kenton MIDI USB Host to add the OP-1 to our setup. Needless to say, these ones above are only two of many setups made possible by these little boxes. The Kenton MIDI Thru 5, like its partner in crime (the MIDI USB Host) is a winner. Reliable and well-built – featuring opto-isolated MIDI in and separate drive for each MIDI out, signal quality restoration circuitry and a power supply – is a godsend for those looking into an affordable and straightforward solution to connect and sync several MIDI devices. Of course in the above setup there is no need for the USB host as the computer can do this job. Yes, if the computer has free USB ports you can do that as well (even though I’d rather let the Kenton handle the MIDI routing to free up some CPU resources. I’ll edit the article. The MIDI USB Host comes in handy when the computer is not involved in the setup. Thanks for your comment. Hi, i think that i noticed you visited my website so i came to Ã¢â‚¬Å“go back the favorÃ¢â‚¬Â.I’m attempting to find things to improve my website!I guess its adequate to use a few of your ideas! !